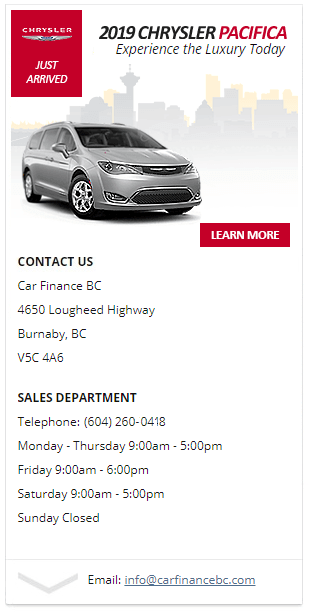 Rebuilding Credit with Car Finance BC in Burnaby! Did you know the fastest and most efficient way to improve your current relationship with future lenders is to rebuild your credit with a car loan? It’s worth noting that checking and verifying your credit is an easy process and free of charge. The two major credit reporting agencies in Canada are Equifax Canada and the TransUnion of Canada. In many cases, potential borrowers can feel overwhelmed by their present circumstances – unfortunately, to where they fail to realize any possibility of turning it around. That is to say; our customers are often surprised just how quick and easy it can be to reverse a bad financial situation. We work closely with our all our customers to provide the historical insights and financial resources to which prove to be of great benef when isolating the reasoning behind their current credit score. As with any loan application, your credit score will play an integral role with regards to the amount of loan on offer, but just as importantly, you should never take out a loan which you may have any trouble to repaying in the future. Our trained credit specialists work alongside numerous financial institutions to provide you with the most favourable terms and re-payment options – best suited to your individual circumstances! When you first opt for a vehicle subprime loan, it is often the case that you are required to accept often-stern terms along with a higher rate of interest. At Car Finance BC we ensure all loan repayments are manageable and acceptable to all our customers. It’s important to remember that with loan repayments – they must be paid on time… each and every time! Having a proven track record is essential for credit purchases. Additionally, being on time with repayments is proven to be great benefit when it comes rebuilding credit with a car loan. Repaying the monthly installments on time (every time) will often result in a lowered rate of interest within a 10 month period. While it may take some time to rebuild your credit rating, it should be noted that rebuilding credit with a car loan is certainly one of the easiest and fastest way to achieve the desired outcome.